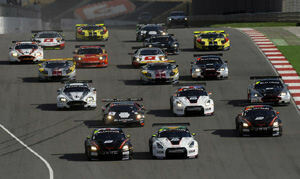 The (almost) perfect weekend for the Nissan GT-R teams. 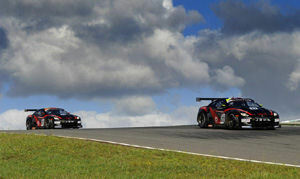 The third round of the 2011 FIA GT1 World Championship was held at the Autódromo Internacional do Algarve in Portimão, Portugal on the weekend of 7th to 8th May, 2011. The Nissan GT-R's of JR Motorsports and Sumo Power GT had a fabulous weekend scoring victories in both races and five of six available podium positions throughout the weekend. 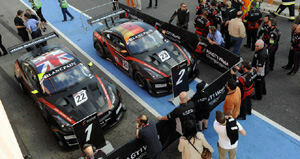 Nissan clinched an emphatic podium clean sweep in the Portimao Qualifying Race, the first ever by a single manufacturer since the series' formation, something that in itself followed on from an unprecedented and amazing feat during the earlier Qualifying session, where all four of the competing Nissan GT-Rs finishing in the top four positions. 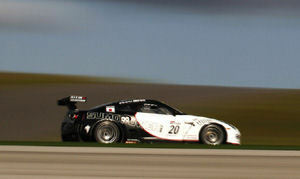 Richard Westbrook and Peter Dumbreck in the No.22 JR Motorsports Nissan GT-R claimed the team's first ever GT1 win. Lucas Luhr and Michael Krumm finished second in the No.23 JRM Nissan GT-R, while the No.21 Sumo Power GT of Jamie Campbell-Walter and David Brabham rounded out the podium top three. It was vital that the Nissan teams' Qualifying efforts didn't go to waste in the Qualifying Race with a repeat of the chaos that wiped the two Sumo Power GTs out during the first few seconds of the Zolder Championship Race. Starting from pole, Dumbreck protected his lead through the opening corners and remained in the lead as he dived into the pit lane, although the sister No.23 JRM Nissan GT-R of Michael Krumm and Lucas Luhr remained within two seconds of the lead. The three drivers used the open space ahead of them to their advantage to quickly build up a commanding lead over the rest of the field, before the two JR Motorsports Nissan GT-R's managed to shake off the attentions of Brabham, who found himself losing tire grip slightly as the race progressed. Though it was a much cleaner start this time around, there was still to be one Nissan casualty as the race began. Ricardo Zonta in the No.20 Sumo Power GT-R, making a quick start from second and jostling with Dumbreck for first position, got clipped from behind in the first corner; an impact that sent him spinning on-track and knocked him back to 13th place. As the pit-window opened on 25 minutes, Dumbreck in No.22 and Krumm in the No.23 JRM Nissan GT-R led Brabham in the No.21 Sumo Power GT car by 4.5 seconds, with Brabham himself opening up a seven second lead over the fourth placed No.8 Young Driver Aston Martin DBR9. Further down the field, Zonta in the remaining Sumo Power GT-R had done an amazing job during his stint in the car to move five places up the field, pitting in eighth place. The pit-stops, which have so far been pivotal to determining the outcome of nearly all the races in this season's Championship, almost proved so again. All four of the Nissan's stops were high quality and incident free, but the stop of the No.23 JR Motorsports GT-R that saw Lucas Luhr take over from Krumm was particularly so, allowing the Germans to take over in first. However, the lead wasn't to last long. After shadowing Luhr for several laps, teammate Richard Westbrook in the No.22 car dived down the inside at turn one to recapture the lead, which he held until the chequered flag came out. Luhr remained glued to Westbrook's tail, with little more than one second separating the two cars, but he was not quite able to find a way through. The two JR Motorsports battled each other to the end, with Luhr pushing hard to overtake in the closing stages as Westbrook struggled slightly with worn tires. But Luhr could find no way through, so it was No.22 JR Motorsports to finish first, No.23 JR Motorsports second, and No.21 Sumo Power GT third. Speaking afterwards, Richard Westbrook said: "I just want to thank Peter and everyone at Nissan and JRM - it's one hell of an achievement to have three cars on the podium. There is a lot of hard work that has gone into this, and while this track is good for us it was so important we made the most of it. Now we look forward to tomorrow. You can definitely overtake here at Portimão, so the Championship Race will be wide open - we have some improvements to make and we'll have the benefit of better tires than today, so we're looking forward to it." Lucas Luhr added: "First of all, our guys did a great pit stop and as I came down the main straight I saw Richard coming out of the pit lane. On my out lap I already was struggling with front grip, and I was struggling a lot in the last corners. Richard had a huge run on me out of the last corner and he dived down the inside - I could have closed it a little bit but at the end we are team-mates and it's important we have a good result for Nissan. The big points come tomorrow however and we have some improvements to make to our car. Hopefully we can repeat something similar in the Championship Race - that would be really great for Nissan." Jamie-Campbell Walter commented: "If we look back to Zolder we had two DNFs, so Sumo Power team were pretty down in the dumps. To bounce back and have three cars on the podium is absolutely fantastic, not only for Sumo Power but also for JRM and Nissan. All credit to them, the Sumo guys have had a hard three weeks since Zolder to repair the cars and we've had a few little problems here from knock-on effects, so to be third is fantastic - it's a huge well done to everybody in the whole team." In addition to the Nissans that took a stranglehold on the first three places, the No.20 Sumo Power GT of Ricardo Zonta and Enrique Bernoldi that was tipped into a spin in the second corner still managed to finish eighth. The No.20 Nissan GT-R's spin was the first of a series of incidents in turns two and three on the opening lap, which ultimately saw the No.7 Young Driver Aston Martin ruled out with suspension damage, and several other cars falling down the order due to spins. 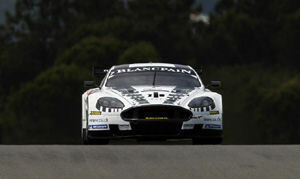 In the confusion, the No.8 Young Driver Aston Martin DBR9 of Stefan Mücke and Darren Turner was able to come through to sixth on the opening lap. Turner made up two further places before handing over to Mücke, who brought the car home in fourth. Fifth went to the No.37 All-Inkl.com Lamborghini Murcielago of Nicky Pastorelli and Dominik Schwager, which enjoyed a remarkable start to move from the rear of the field into seventh. The duo had been jumped during the pit window by the No.41 Marc VDS Ford GT of Yann Clairay and Maxime Martin, but found a way back past the Ford with little more than ten minutes of the race remaining. 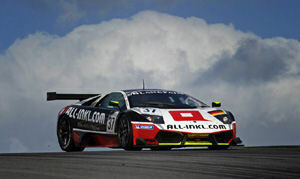 Championship leaders Markus Winkelhock and Marc Basseng also made a good start in the sister No.38 All-Inkl.com Lamborghini to sit fifth after the first lap. Their 50kg of success ballast, received due to an outstanding double win in Zolder, however caused the duo to fall back to seventh.